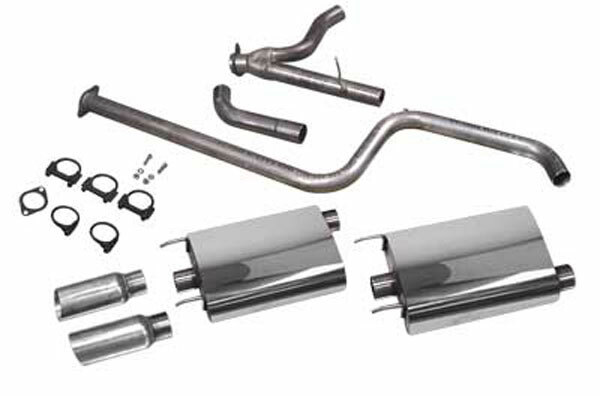 SLP Performance 31040AM - SLP Exhaust System, Grand Prix PowerFlo w/3.5 Slash Tips; 1997-2007. Bolt on a new Power-Flo catalyst-back exhaust system from SLP on your Grand Prix for up to 10 extra horsepower with a low, musclecar rumble. Our engineers specifically developed this system to sound great and build power for the V6 3800 standard or supercharged engine platform. It sounds more aggressive than stock on the street, but with minimized interior cabin resonance. This system features a pair of big 3.5-inch slash-cut stainless polished tips for a muscle car style that will look great on your car. The exhaust system is hand-crafted from 409 and stainless steel. The tubing is bent on state-of-the-art CNC bending equipment using mandrel-bend tooling to minimize exhaust gas restrictions that come with factory systems, and is covered with our Limited Lifetime Warranty. Emissions-legal in all 50 states. * Volume and sound quality will vary based on engine and exhaust-system specifications. Loudmouth also refers to some systems without any resonators such as the 2010 Camaro Loud Mouth and the 2005 Mustang Loud Mouth Axle backs where the mufflers are removed altogether. Images below are representations in order to better understand the differences. ; SLP® Competition Parts, and SLP® Crate Engines, which the warranty coverage for the foregoing, if any, is separate from that explained here. History and information about SLP Performance and their products. Since 2001, LMPerformance has worked closely with SLP Performance to offer customers a wide range of performance enhancements to the American muscle car, the best known of which is its SLP Loudmouth muffler and SLP Camaro systems. With our SLP Performance parts line we have helped customers transform late-model rides into modern muscle cars like the Camaro SS and Pontiac Firehawk. True to its name, Street Legal Performance (SLP) has a vision "to not just provide performance, but to do so with the best engineering practices and quality possible, far exceeding the industry standards." Impressively, SLP was the first company in the performance aftermarket to develop and manufacture a 50-state emission-legal performance package specifically for V8 Camaros and Firebirds. LMPerformance carries SLP&apos;s best-in-class performance upgrades in the following product categories: TVS Supercharger Packages, Blackwing Cold Air Intakes, SLP Exhaust Tips, SLP Loudmouth Mufflers, Powerflo Headers, SLP Accessories, SLP Suspension, SLP Brake Kits and SLP Wheels. The range of applications offered by the SLP line is equally as wide. Below is just a partial list: Chevy Camaro, Corvette, GM/GMC Trucks and SUVs, Pontiac Firebird, GTP, G8, GXP and GTO, Ford Mustang and F-150, Dodge Challenger, Charger, Magnum and 300. Had this installed 5 years ago and still loving it. Nice mellow rumble, not a v8 but not too bad for a 6. Mufflers and tips look as shiny as new. Reviews for SLP Performance's Other products are show below. Slp's Cold Air Induction Package Kit worked great for about 12 years on my 2002 Camaro Z-28, I purchased this Camaro new in 2002 and treated the car with excellent care, 13 years out and only 39000 miles. My mods worked well till a RAINY day in May and 5&quot; of water at 1-2 miles an hour, at 1200rpm HYDRO-LOCKED the motor.........2 rods cracked the block and it was BYE-BYE to a my ole faithful LS-1.......Hello, LS376/525 crate engine from GM. I am now configuring a similar system to the C-5 Corvette with a intake bridge and a ram horn split filter if it will fit. The SLP down duct work is not totally to blame for the death of my LS1. The air dam that smooths under car air flow was positioned with a forward angle to scavenge more air to enter the SLP duct. The duct was extended with additional sheet metal and increased efficiency by 25%..........this works fine with 02, not with H20.....that's air not water, for those of you that slept thru Chemistry. My only concern now, after paying off my creditcards 10,000.00 balance, is the positioning of this new CAI and MAF. The LS3 motor in the 525 hp asa cam version is particular to the MAF position from the TB and current opinion is 10 &quot; away and in a straight section of tube, also the resisters in the Granatelli 85mm MAF may not communicate well with the aftermarket tuners, so I guess its HP professional tuner time. Sure hope this Bad Boy doesn't eat my 4L60E and 10 bolt rear end, but I can't wait to see the vet owners and new Camaro guys listen to that 110LSA, then I crack the electronic cutouts open, and see if these Nitto sticky tires can hold on to the road, while the other guys try to find a gear that works...............stay away from puddles. SLP CAI, 160 deg. thermos, competition harmonic balancer,4L60E shift kit, 3400 rpm stall converter, 373 rear end gears, granatelli 85mm maf ,Diablo predator reprogram, dual exhaust.224/224/581/581 comp cam with 114lsa and dual springs. Great Product that's easy to install. I noticed only a slight increase in the sound on startup but no difference while driving. The only difference while driving was some burbling on deceleration. Even swapping out the factory muffler only slightly increased the sound. Greatly improves acceleration. Not that hard to install. First mod with opened up fog light surrounds to improve air flow. Installed on 2010 Yukon Denali 6.2L. Highly recommend this product. Very high quality piece. Easy to install, looks great and b/c you''re deleting the final resonator, it''s sounds awesome! Only slight increase in exhaust note but, not obnoxious and slight burble on deceleration. The pipe is certainly a nicer than the stock y-pipe. It's supposed to fit without any issues on my 2002 TA. The holes for the flanges to connect to the catalytic converters are too far apart and had to grind the inner so it would fit like it's supposed to. The outlet is shorter than the stock y-pipe. Going to bring this to an exhaust shop and let them fiddle with it and get it to fit properly. It will be nice once it's done, but not happy about having to bring it elsewhere. Had to elongate the flange holes. They were wayyyyyy too wide for the catalytic converters bolts. What a pain in the a$$. And as noted in other reviews, the output y tip is a bit shorter than the stock y pipe. Nothing as I'm still working on this y-pipe fitment. Great exhaust. Loud at wide open. Nice rumble at idle. Install took less than hour with access to a lift. Don''t think you''ll find a better exhaust for the money. Exchanged stock exhaust with SLP Loudmouth Exhaust for v6 2010-2014 Axle-back system. Wasnt sure weather ta get tha lm 1 or 2 so ta stay sound ordinence safe and I have no complaints. Its loud super aggressive and deep. I have tha cats removed and 1 loudmouth II that "y's" into 3 1/2 tips and its deep. Very satisfied but im changing to the loudmouth 1 because I want stupid loud lol. But if you want a good deep agressive muscle car sound thats just loud enough tha loudmouth 2 is tha way to go!!! Just purchased a set of Loudmouth 1 resonator's about 2 weeks ago. Fast shipping, And they sound absolutely amazing!!! Real Mean Agressive Tones... Custom istalled them on a Cadillac Eldorado with the northstar single exhaust with Y pipe in the rear and 10 out of 10 on the sound. The best sound i have ever heard.. You must buy! yull be shocked, music to your ear's if your looking for a real mean sound and you want Loud buy them, not as loud as you would think inside the car just pure mean agressive sound...yull havta experience it to believe it! just be easy on that pedal when you pass the law lol they are LOUD. Very Pleased!!! defintly worth it. I listened to tons of sound clips. Then decided to do it right or leave it if you really want a change to stock exhaust.It is significantly louder and I guess it turns some heads. Sounds and feels great- also the tips look awesome. If you want that the look no further! Love the cold air intake. I was suprised about having to cut the old shield, but was easy to trim up. Can tell the difference at idle, and opening up. Other then a pain trying to get the MAF sensor to slide into the neck (instruction say to heat up the airlid neck with a blow dryer), the lid really does clean up the engine bay. Car is a little more noisy when leaning into since the baffles are removed, but otherwise performance is way better. Definitely worth it. SLP Airlid, SLP Bellow, K&N Filter, UMI 3-Point Sub-Frame Connectors, Spohn Tunnel Brace, Spohn Strut Tower Bar. The unit was very easy to install and works like a dream. It's very nice to get rid of the skip shift option. i would recommend this item. This exhaust is amazing. Videos do it no justice until you hear it in person. LM Performance delivered as expected, 2 days and it was at my house. Thanks! This exhaust really sounds awesome, a great addition to my 2011 camaro v6. Easy install, great price, and fast shipment from lm performance. Thank you. I noticed a difference as soon as I hit the gas the first time, not a big difference but definitely 5-7whp and noticeably better throttle response. Install is straight forward, you definitely need to use a hair drier to get the mad back on, other than that easy hp. massive spark plugg wires , ngk tr pluggs, afe power cold air intake, underdrive, synthetic, v-power gas only , next is custom x pipe , getting rid of resonator factory. we had to replace the y pipe due to the customer running thier car off road the OEM y pipe is nonexistant, i was almost ready to have one made to finish this job then i found this one on LM performance on a web search, i was realy not sure it would work but i was desparate,i also ordered a pair of magnaflow 49 state direct fit catalytic converts, i have to tell you these three parts saved me some hassle they are great the difference between the oem y pipe and the new one is the oem is flat and looks restrictive, the new one is round and "full open" these parts fit as good as OEM only difference is the center "exhaust" crossmember had to be taken off for clearance and it is realy not anything but a scrape guard. I have a v6 camaro and it was an easy part to install only took about an hour. PERFECT upgrade from the stock Camaro y pipe. I can feel more power throughout my car. Thanks! I couldn''t be happier!!! This exhaust was exactly what I was looking for. SOUNDS GREAT!!! And easy to install. As far as shipping goes, it only too THREE DAYS. ordered it on Friday and had it installed TUESDAY A+++++++ SHIPPING!!! The pipe was a little short in the tail end but it still worked out. I might have to extended the tail of the Y pipe though. SLP Lid, SLP MAF, SLP Smooth Bellow, Magna Flow cat back exhaust back exhaust, Spohn adjustable strut tower brace, Spohn Tunnel brace, SLP performance Y pipe. You will find out the other mods if any want to race. I had a Flowmaster 80 series on the stock tail pipes with the rectangular tips. It really sounded good, but I wanted something louder. My son suggested the LMII mounted as a single muffler and dumping it before the rear axle. Well, I was surprised at the sound!! It really sounds great on the Camaro since it is low to the ground and the sound is amplified bouncing off the pavement. I must say I do miss the look of the dual tips I had, but I'll get over it. There is a drone sound inside, but I like the aggressive sound and generally ride with the windows down and the radio turned down. A great product by SLP!! My car is a B4C edition. It came with quite a few extras including the LS6 intake and block. I added the SLP Air Lid a few months ago. This system sounds great. but if you have crabby neighbors who dont know a thing about cars or the appreciation of good old american muscle,Id get something a little less aggressive. This system WILL wake them up and get the cops called. If you driver your car everyday you might want something a little more quiet. The system sounds great but can get on your nerves when your in the drive thru. If your looking for that NASCAR sound this is the package to get. full SLP system from heads to tips. fast service. fast delivery. slightly easy installation. very satisfied. will definitely be doing future business with y'all again. Simply put, these sound very aggressive, throaty, and loud. There is some resonance at particular RPM's, but since I have a six speed, it can easily be accomodated for. I have had these for about six weeks, and someone yells out their car window at me about once a week telling me how good this car sounds. The sound clip on here is good, but in real life they sound deeper and throatier than on the video. Nice 'burble' type sound when deaccelerating. All around great sounding pipes!! Let me tell you all something. I've owned 3 Mustangs. My 2011 GT is the quietest stock than the others (04'GT, and 10' GT) Soo 3 days ago I recieved my SLP's.. which only took 2 business days to get here!! Super fast shipping!! I work at a dealership which I had them install on a lift which took less than 30 min. When they started my car up, EVERYONE circled around, and the only thing anyone said was OMG that sounds GOOD! I have gotten over 20 compliments from around my dealership in the past 2 days. Be aware they are LOUD!!! People are BLOWN away when you tell them all you have is axle-backs, they think you are bluffing. THESE ARE THE REAL DEAL FOLKS !!!! 5 stars to SLP and 5 stars for LM performance for price and quick shipping!!! The SLP 2011 Mustang GT Loudmouth Axle-Back Exhaust is my first Modification to my unbelievable 5.0. This needs no explanation,if you own one. Just a regular K&N filter. Cant go wrong... might wake up the neighborhood when you start it, thats all. haha. I LOVE THE PURR YOU GET WITH THEM! I now have the most aggressive sounding corvette in town. It will flat turn some heads. installed system in 30 minutes/perfect fit/sounds great/looks great,worth every penny.thanks to LMperformance for processing order quickly.slp makes a great exhaust system for the gto. It was a little aggravating to install. I have ran other intakes and cant say that I noticed a difference in between slp's and other brands. It does sound nice. Is worth the money not by much tho. I just put these on my 99 Z28 an oh my god i got in my car and cranked it over, it made that LS1 Growl! Item was shipped in about 4 days, I was very impressed. I would reccommend this site an the SLP Loudmouth II to anyone with a F-Body!!! I have to say that I am very pleased with the SLP Loudmouth exhaust! The installation was a snap... took about an hour. The sound is incredible!! This was my first mod on my Camaro and I have to say it turned this V6 from a tame kitty purr to a fierce lion roar! The product is well made and very solid plus the tips look awesome. I would recommend this to anyone who wants to enhance the engines sound and turn a few heads along the way. SLP long-tube headers and SLP LM-1 exhaust on a 2000 SS camaro. I had SLP's long tube headers installed on my 2000 SS camaro along with the Loudmouth 1 exhaust. The performance and sound from these two components is awesome. If you want the meanest and loudest then I recommend these. Just a note, if you're putting these on the Camaro my "service engine soon" light started to come on after install. The sound that comes out of the Loudmouth II is awesome!! Well above the expected sound. Gives the V6 a V7 like sound that reverberates through around town cruising. Above 3000 rpm transforms the low growl to a roar and an ear to ear grin on the driver. I love these exhaust. It is by far the best invest i could make. There perfect. There loud enough to turn heads but when you get up to 5th gear its a nice lil rumble but not to loud to get on your nerves either. i love em. quick delivery on LM's part; got to me within 2 days. Took about 4 hours to put the catback on as I ran into issues removing the stock unit. The SLP catback is made well and fitted together good. The instructions it came with weren't the greatest, but it did its job. Overall fitment of the parts was good. I had a slight clearance issue with the pipe over the rearend, but nothing too bad. Sound is good, idle is a bit louder and deeper than stock. Under load, it is louder (cabin noise isn't much higher) and definately has more rumble and less drone than the stock exhaust. This is a great system for the price. Personally the install was easy, directions were simple. Fit and finish is good. I love the sound that it delivers, not so much for the wife. I warned her for over 2yrs this was going to happen. Now, she isn't so pleased. I even got a guy with a Viper RT/10 to snap his head and give the thumbs up! Noticed a gas mileage increase already, as long as you keep your foot out of the pedal! With the 4 cyl shut down, you can really hear the note change at cruising speeds, and I think it makes it easier to stay in that fuel saver mode. Thanks for the product, really enjoy it. No Additional Mod's at this time. I was running long tubes, O/R H pipe, and these SLP LM1 and the car was AGGRESSIVE and sounded AWESOME!!! There was nothing that sounded this mean on the street!! It was loud enough to hear me for miles!!!! Get this exhaust if you looking for mean and raw power sound! 2000 Mustang GT - Full bolt ons, full suspension, with nitrous. This exhaust added a lot more horsepwer and sound mean amd loud!!!!! Just installed the SLP Loudmouth axle back system, sounds great. Installation was a little tricky as the exsisting system had a stud that had to be ground down to allow the SLP pipe to go over the forward exhaust system. Also the SLP passenger side pipe hanger rod had to be re-bent a little in order for the pipe to run straight out the back. The driver side went on with no problem, all in all it took about 1.5 hours - only because I had to grind off the studs on the exsisting system and bend one rod. Saleen Supercharger, Racecraft suspension system, 2.5 Ford Performance Exhaust System. 420 hp 400 ft lbs torque. The SLP Cold Air Intake for the LT1/LT5 Corvette is an interesting addition. It is as the manufacturers claim, support up to an additional 20 HP based on application. As i applied this to at the time full stock engine, i havent noticed any performance gain. This initially disappointed me, given the price of it. However, i have noticed it benefit as i added more performance bolt-on additions to the car. I do believe that this intake can reach its peak potential HP gain when the entire engine itself has been upgraded such as: All bolt-ons, head porting, intake manifold porting and larger cam with the addition of a tune. Overall quality of the product is relatively good, with the exception is that it is heavy (for an intake) and one could see the weld-marks inside the intake tubes. Kudos to how it looks though, definitely looks different then alot of other intakes out there. I give it a 3 out of 5 because that is how it feels, average, the gains only show when the rest of the engine performance has improved. good exhaust! excellent fit, installed in about 30 minutes in my driveway with jack stands. however it is not 304 stainless steel as advertised *(the mufflers may be) and the mufflers look amazing like a mirror. but the rest of the tubing is not 304 it is a lower grade 409. Welded it on instead of the clamps because i didnt want them to be visible. The sound is like no other and completely exceded my expectations. Highly recommend it to any one who wants to really let their f-body breath. Great exhaust and it really makes this car sound like a muscle car. Easy to install in about 20 minutes. After listening to the sample SLP video of these pipes, we were impressed and bought them after listening to them all. Installation took 30 minutes just like the instructions said and these were very simple to install. Sound is amazing. We were not let down with this product and would recommend to anyone looking for a great sound with a quick and easy install that the do it yourself guy at home can do. This is the first mod. The X pipe needs to be marked bottom or top. This would eliminate the guess work in installing it and aligning the rest of the exhaust system. In the instructions it says to use the two old muffler support hangers faceing outward. It should say the two faceing inward.Other than these two small details the fit is good and the sound is nice. No mods on my 2010 Camaro SS. easy install and made my stang sound tough as hell!!!! love it!! Top quality workmanship! great fit! One note: to all Z71 Tahoe owners..you will need to trim a small portion of the bottom of the fender flare for chrome tip clearance. And if you have the factory accessory mud flaps it too will need to be trimmed. Gives a nice idle exhaust note..not too loud! With this intake, cat-back and MAF, I reached 320 hp at the rear wheels while getting between 18 and 21 mpg in the city and 27-29 mpg highway. It's worth the money!! Installation Time ~1.5hours Noticeable low end improvement Great sound. On deceleration there is very audible "gurgle" in the exhaust. Gas mileage actually decreased slightly. Expect that tuning and dyno time will improve both HP and MPG further. MY STANG SOUNDS AWESOME NOW, LIKE A V8 MUSCLE CAR SHOULD. IT SEEMS LIKE ITS THREE TIMES LOUDER THAN STOCK! ITS EASILY THE LOUDEST STANG IN MY AREA NOW, AND AMONG THE LOUDEST MUSCLE CARS PERIOD, AND I HAVENT EVEN ADDED THE LONGTUBE HEADERS AND OFF ROAD H-PIPE YET!! !